Trulle offers basic and intermediate sea kayaking courses with instructors certified through the Norwegian Paddling Foundation. Our courses are priced with students in mind. Courses are mainly run in the spring and fall. By far the most thorough course- this is a 16 hour course where you will learn safe paddling practices, self and buddy rescues, effective maneuvering and paddling strokes. This course is designed for beginners to develop the skill set and knowledge to begin sea kayaking in calm waters. Courses are held from the Trulle boathouse and most often run over a weekend or several weekday evenings. You will receive a "våtkort" upon completion which is your Norwegian paddling passport allowing you to rent gear and join clubs all around Norway. This price includes kayak and drysuit rental and all kayaking accessories. This course is required if you would like your own key to the boathouse. To be added to the waitlist fill in the form below. You will be contacted when the next course opens up. As of Summer 2017 the next course will be head in Fall 2017. This is the second level of sea kayaking in the Norwegian Paddling foundation course ladder. In this 16 hour course you will expand your grasp of basic and intermediate techniques, be introduced to rougher water and touch on towing techniques. Of course, different rescuing techniques are also drilled. While not required, we do recommend that you have taken the basic course before embarking on the technique course. The technique course are normally held out at Sommarøya and overnighting out there in tents can be part of the experience. Interested in being a Instructor? Get sponsored by Trulle! We can help pay for your Activity leader certification in exchange for teaching some courses for Trulle members. Please let us know if you are interested! 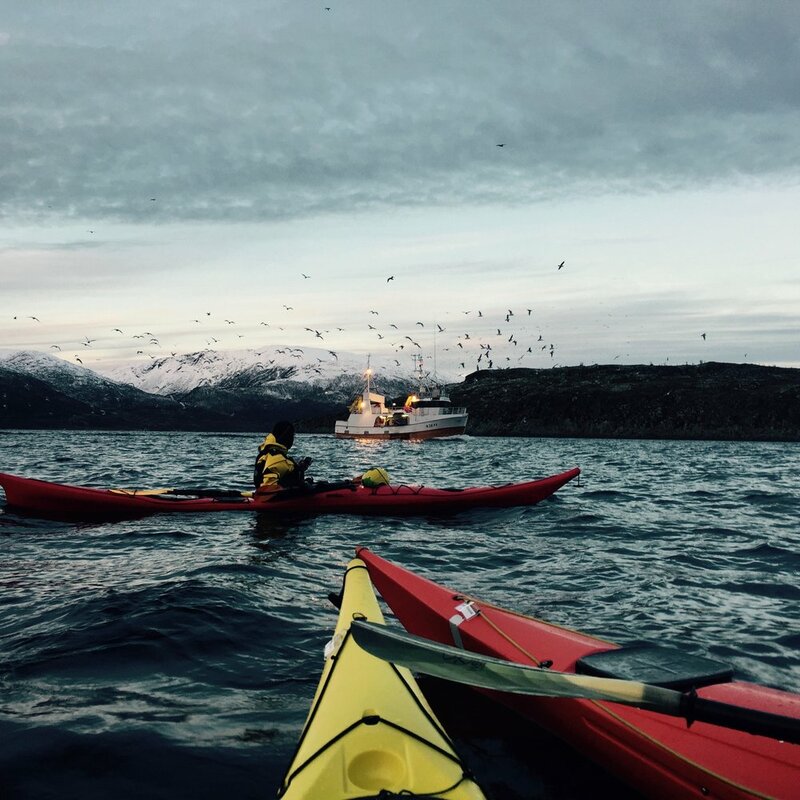 There are several other operators which run sea kayaking courses in / around Tromsø. Where : Courses will be held out of the Trulle boathouse on the island just South of the Airport. It is red and the most southern and biggest. Parking can be found across the road from Plantasjen (on the sea side) and then just walk south along the beach until you reach the last boathouse (Ca. 100 m) Kvaløyvegen 281 is pretty close to the correct address (see "ABOUT" page for map). When: On Saturday we will meet at 0900 and finish no later than 1600, a similar schedule will follow on Sunday. Drysuits will be provided for each one of you. Let us know if you have your own drysuit. What: We will be doing alot of swimming (rescuing) both days and while the suits will keep you warm and happy, unfortunately they are not 100% dry. Bring extra clothes to change into and a warm jacket for lunch. The best thing to wear under the drysuit is wool underwear with thick wool socks. With the chilly temperatures bring a wool hat too! We will be around the boathouse all day so please pack a hearty meal with snacks and water. We will not be paddling far the first day so packing things in drybags is not necessary. How: The course costs 1800 nok for students and 2200 nok for non students (unfortunately PhDs too) including kayak, drysuit, safety gear, and your new våtkort ! Membership is required for all participants and can be purchased in the website store (250,- for a semester, 400,- for a year). A key to the boathouse (100,-) can also be purchased online. Please do this before your course so we can issue a key as soon as you are done on Sunday. The membership and basic course with Trulle will give you unlimited free access to the 19 Trulle kayaks and option for drysuit rental. Looking forward to paddling with you!